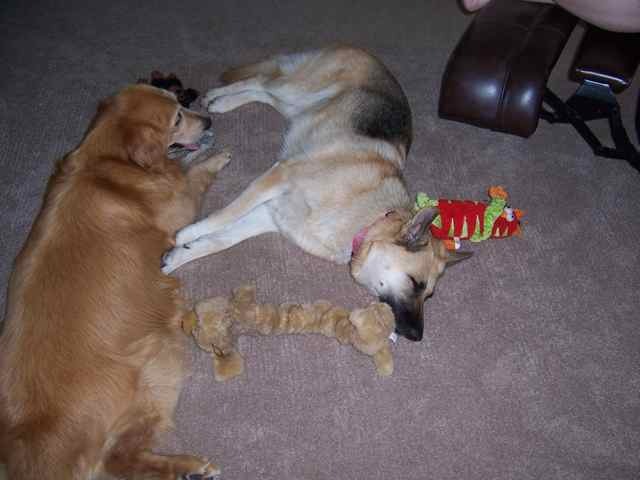 We love it when our adopters share their stories of the new members of their families. 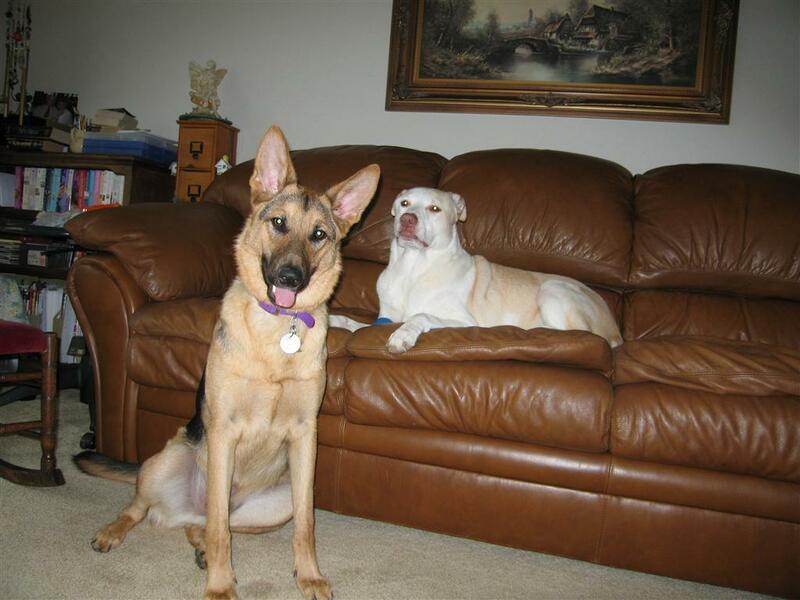 We hope you enjoy reading their Happy Tails and seeing their updated pictures as much as we do! 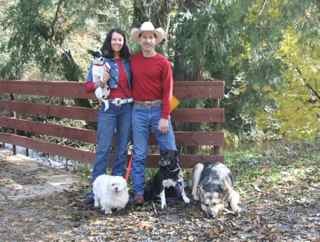 All of our dogs have their own page on our website, from the very beginning when first brought into our group to their most recent adventures the owners share with us! We're working on updating all of them as we get new testimonials or time. Please note that individual pages usually will have lots of photos so may take a few moments to load. But we promise, the wait will be worth it! If you have an update you'd like to share with us, send your pictures and updates to WebShepherd@gcgsr.org. Thank you! 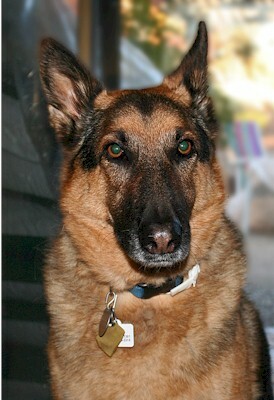 We adopted Kalina in front of Modesto's Petsmart in March of 2005, and she has been a joy! 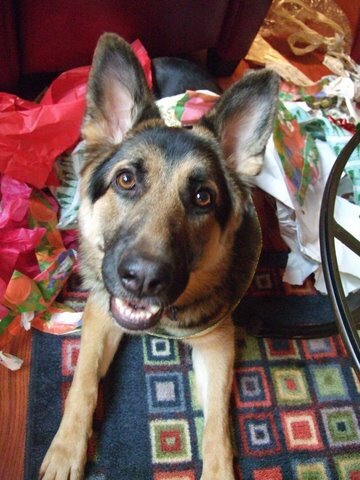 We wish everyone at GCGSR a Merry Christmas and thank you for connecting us with such a wonderful dog! Trixie is the best dog there is paws down. She is making an impressive foray into agility and seems to learn anything new in a matter of moments. 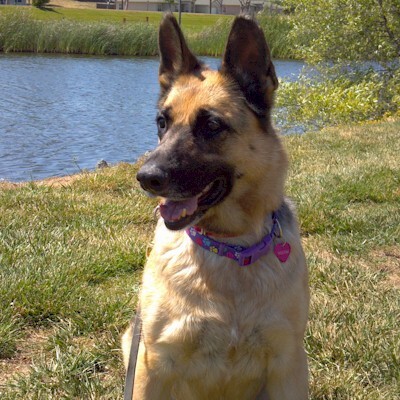 She loves to go for hikes at the lake, play with her lab friend in the water and loves to fetch her tennis ball, she is also very fond of her squeaky toys. 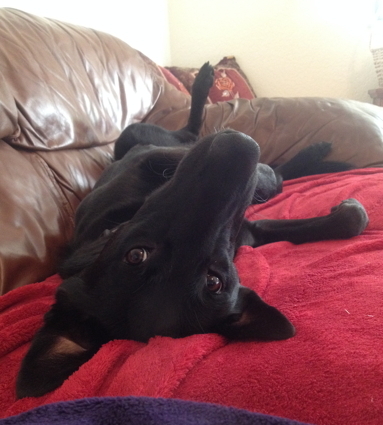 This girl is the best and she is ready to go whenever I am but just as happy to laze around too. She loves her doggy door and likes to lay in the flowerbed in the sun and roll around on her back so I will give her belly rubs. She is the best girl I have ever met and i am lucky to have her. I have been checking your Facebook page and website and I thought it would be nice to show you some of Vida's (aka Anja) pictures. 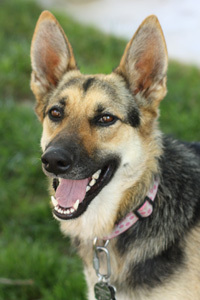 Vida came to you in January 2012 and I adopted her in March 2012. She is amazing and it seems like she has been with us forever. 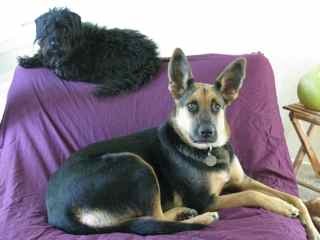 She lives with my wife and I as well as 4 cats and Buddy an Australian Shepard mix in our house in Tracy, CA. We all get along very very well and have a lot of fun. I can't believe how people could not want her. But lucky me somebody did. 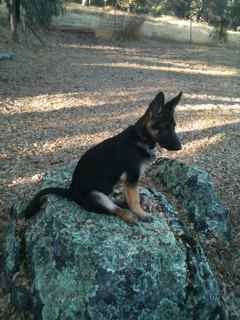 On long walks and hikes people even have asked me from what breeder I got her from or if I would sell her. But there is no way I would ever give her away. Well anyway, here are some of her pics. Thank you all for the great work you do. 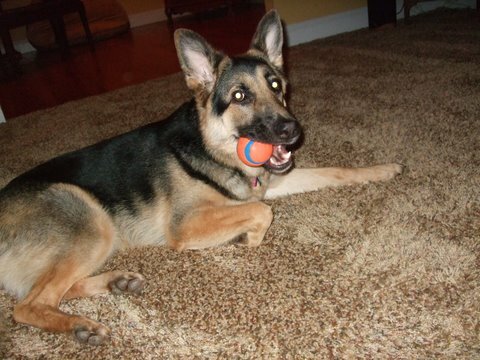 We fostered Haylee (formerly Akela) for a month and then we adopted her, so we have had her for 2 months now. We couldn't ask for a better dog. 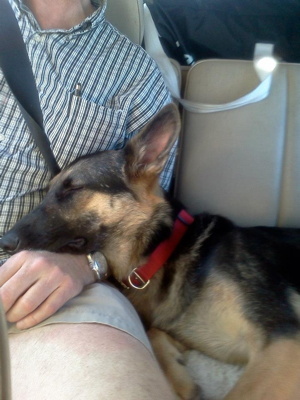 She is a very mellow dog. Loves to sleep, but also loves to play. She always has to know where I am and follows me around the house. She only barks when she is protecting the house. We really got lucky adopting her and she got lucky also. She has found her furrever home here with us and we Love her very much. 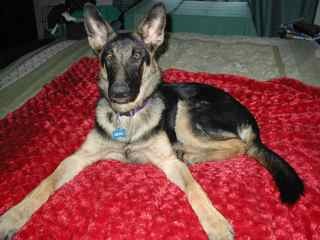 On this her third birthday, Elke (formerly Helga) sends her gratitude and good wishes to the wonderful people at GCGSR who in 2011 made her second chance possible, and helped her Dad through her amazing puppy hood. She also wants you to know she's very comfortable, feeling totally safe, and that even girls who just wanna have fun have to nap sometimes. 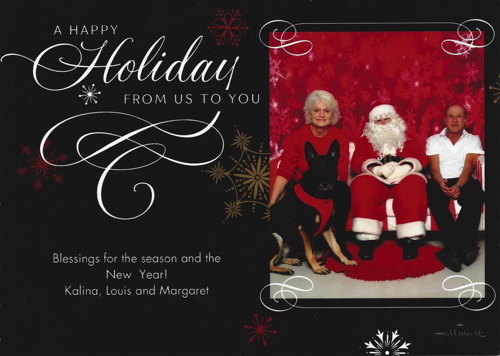 Although the adoption is not final yet we are planning to move forward to make her adoption final so hope the early Christmas card is okay. We are happy Mika has chosen us and has enjoyed staying in our home as sometimes when a dog doesn't want to be here, you can tell from how they behave and act so we are happy to say we love that she has chosen to stay as I fell in love with her. 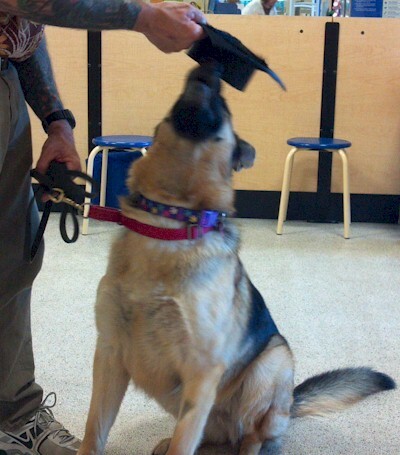 Since adopting Freedom in February, she has graduated from beginner's and intermediate obedience classes at PetSmart. She will be attending the advanced classes starting in July. 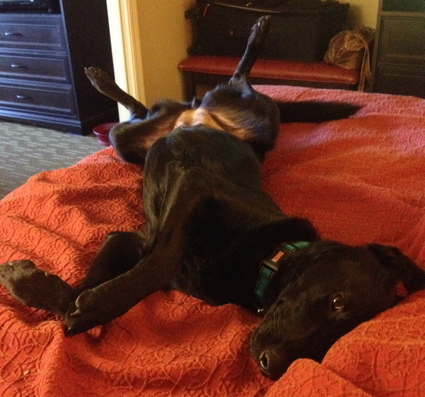 She was thin when we got her, weighing in at 69 lbs, and has filled out beautifully to 89 lbs. Her best friend (besides us) is our 10 lb cat, Quigley, and she loves to see her other feline friend, Scooter, who lives around the corner. She is a GREAT DOG! 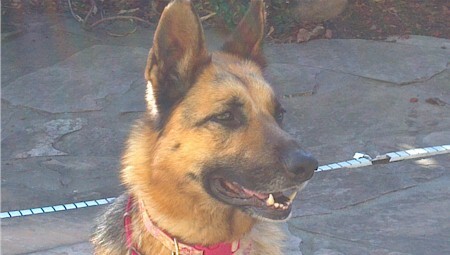 My wife, Diane and I adopted Freedom from you (foster Mom; Kim D) at the Vacaville PetSmart on Feb 11, 2012. Your website doesn't include her, but I wanted to let you know she is a GREAT DOG! She has rapidly become an important member of our family and loves all three of us (including Quigley, the cat). 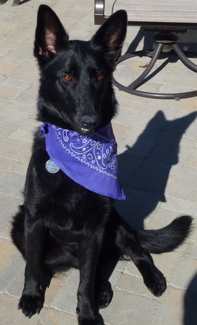 We have been teaching her social skills, and she is the star pupil at the obedience classes we are attending. She loves being an indoor dog, and has excellent house manners. Thank you for not cancelling your Vacaville events before we found her! Keep up the great work you are doing. From Problem Child to Living the Good Life! Thought you might like to see Tucker aka Trekker. We adopted him about 2 1/2 yrs. ago. I think you may remember I mentioned he would be the lucky dog of the year with summers on a lake and winters in the foothills. I think he may have been a problem child and hard to adopt with a few annoying bad habits. These pics show he did indeed adapt well and enjoys the good life. He loves his stuffed bears and loves to sleep in front of the pellet stove, even better with the sun shinning on him. 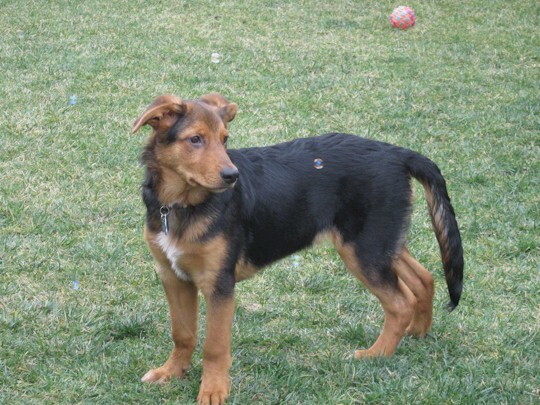 Zack now resides with two humans, a female GSD, an old male shepherd/husky mix, six cats and occasional foster dogs and/or puppies. He has become the play toy for the puppies fostered here and helps them release their energy and biting that would otherwise be released on the humans. 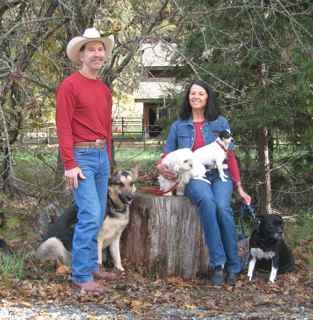 He is also a volunteer through the Sacramento SPCA's "Love On Loan" program, which means he provides pet therapy at a convalescence home. 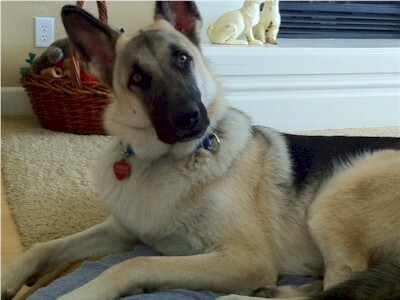 I bring him to UC Davis regularly so he can donate blood (see picture) and save other dogs's lives. 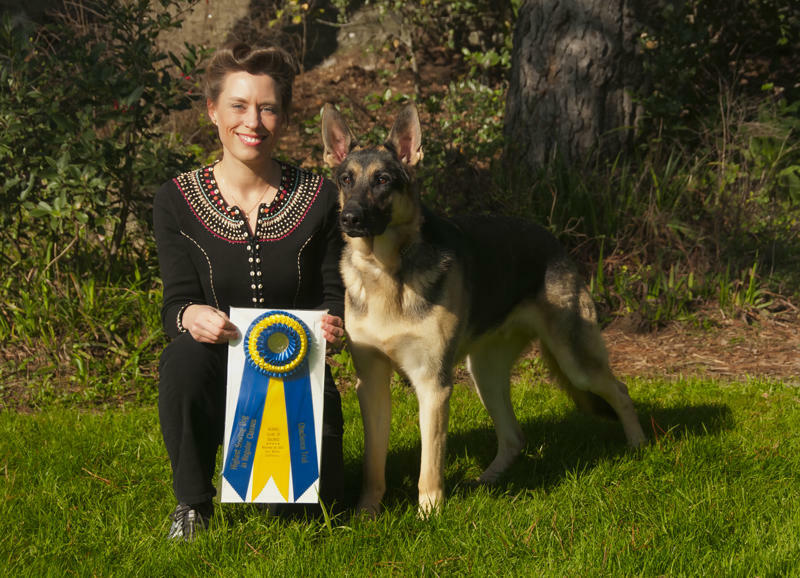 Earlier this month, we debuted in Open (the intermediate level of AKC Obedience). 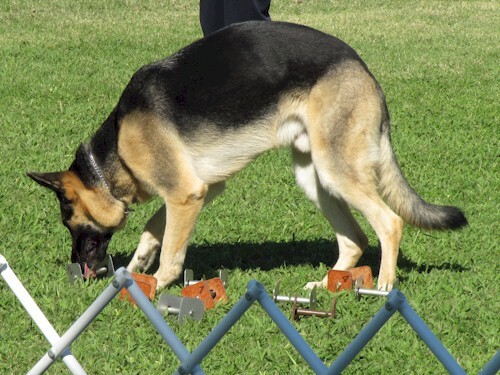 Dante went 3-for-3, earning his Companion Dog Excellent (CDX) title in 3 straight trials across 2 weekends, winning a 2nd place and two 1st places along the way. So, the next weekend we moved up to the Utility level (the advanced level of AKC Obedience). 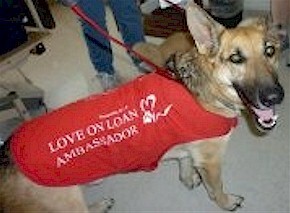 . .
We finalized Blanca's adoption 2 years ago September, when she was around 3 years old. We made Sept 12 her 5th birthday. 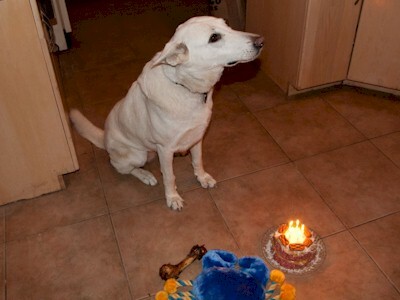 She got a cake made from ground beef and peanut butter topped with parmesan cheese and salmon treats. She also got a new toy and a ham bone. Blanca sat and waited for about a minute while we took pictures. Very well disciplined. Two whole years. I remember Jody came to do the home visit. I'm guessing we were not ideal adopters with basically no experience. Stan described Blanca as "Level 2 . . . barely" which got us approved. She lived up to that low level 2 except for a great deal of talent escaping from her crate . 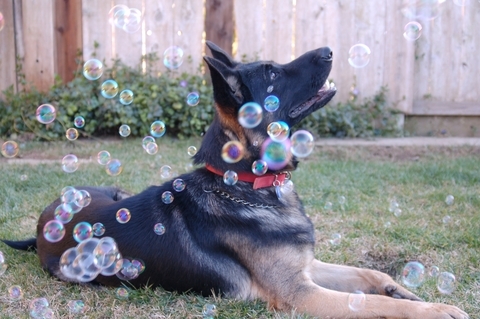 . .
Our boys love to feed him and throw squeaky toys for him to fetch. He has learned sit, come, down, stay, "drop it" and is 99% house trained. We are still working on "leave it" and off. He is a wonderful addition to our family and we are thankful to Kim and Barbara and the rest of GCGSR for helping us find him! Rick, Rebecca, Mateo, and Gabriel B. An update on Nani . . . (adopted in March this yr). This past weekend I walked along with my trusty sidekicks Luke and Nani for the American Heart Association Stanislaus Heart Walk. They won the Best Dressed Dog Award for their get-ups. It's kind of hard to see in the pix but Luke is wearing a Hawaiian shirt and Nani has on a bikini top and flower necklace. They even let three of my co-workers and I trade off on walking them. We're having lots of fun with this crazy girl! 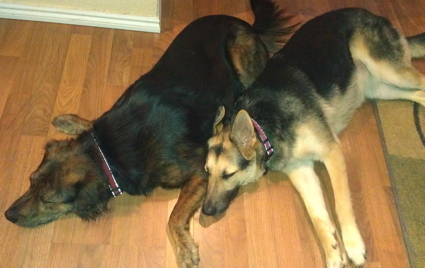 We had a couple of pictures of Knox and Yada that were too cute to keep. Enjoy! This is Cynthia and Lance with Dexter. He is doing wonderful and having a great life. He is learning a lot and playing with new friends every weekend at the doggy park. He has been camping with horses and boating too. We have been playing in the snow and just lounging around in the pool. Here are some pictures for your album too. Thanks again! I adopted Teddy one year ago when he was 8 weeks old. Just thought you'd enjoy the picture of him THEN and NOW. 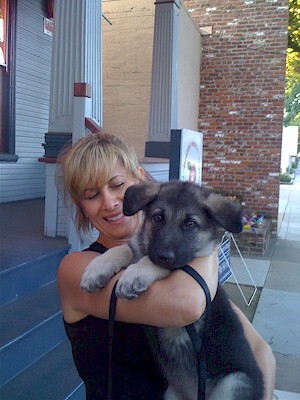 (I can't believe he was ever that small!) He's such a great dog! 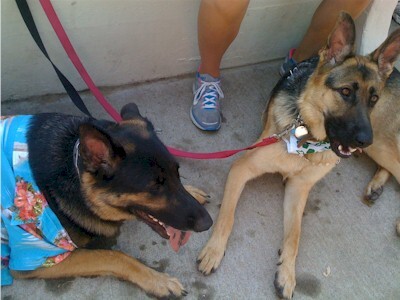 Thank you to Greater Calif GSD rescue for matching us up perfectly. He's a good boy, at the studio with Lil Bear, and at home with the bunnies! . . .and NOW! For all of the in-between pictures, see Teddy's page. Hello Friends, I wanted to tell you how happy we are! Reighnger is a perfect fit. We all just love him and so do our friends. It took him a few weeks to really realize that this is his forever home and when he did he seemed to be able to relax more. He's gotten into the groove of how his new family works and loves his new Grandpa "Rusteigh." Hi Nicole, below is the video that I took of Sammy having a great time playing in the water, what an awesome dog, love him sooooo much!!!! He's on YouTube now, he's famous, LOL!!! Dante (formerly Connor) Goes High In Trial - 2nd Time! 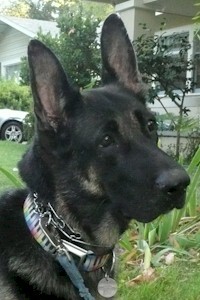 Just wanted to say "hi" and to give you the latest update on Dante's continuing Obedience career. Last weekend we were competing in a regional Obedience event in Reno. On Saturday, Dante took High In Trial (HIT) with a 198.5 in Novice B. That day we beat a former National Obedience Champion (again), as well as a number of other strong competitors who have previously gotten OTChs and perfect 200 scores. So, it was pretty tough competition. 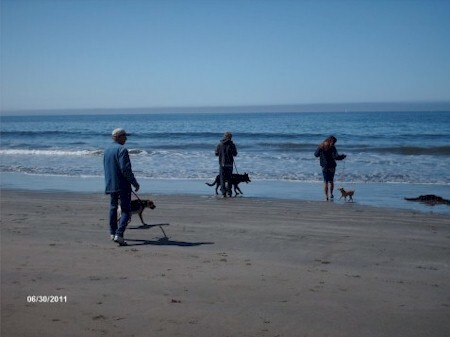 . .
We took the dogs and stayed a few days at Bodega Harbor with the grandkids in June. 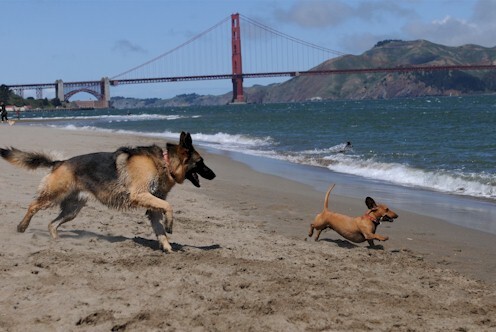 It was Angus (Tango) and Dolly's (Dahlia) first time at the beach. They were not too impressed with the ocean, but they loved the easy digging in the sand and made themselves a little dog fort under a driftwood log. I've attached a couple photos for you. 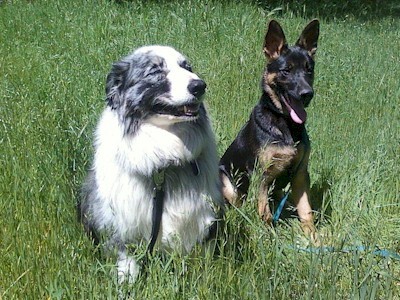 Angus is about 80lbs plus now and Dolly is staying at about 50lbs. . . . I just wanted to drop you an email to let you know how Lilly is doing. Today we took her to the beach (she loves going to the beach as you can see). We are so happy with Lilly, we couldnt have asked for a better dog!!!!!! Her and Jackson are now best friends and they spend all day hunting moles and making sure the horses and sheep stay on their side of the fence. I honestly wasnt sure if they were ever going to bond . . .
Just wanted to send an update. Match made in Heaven. 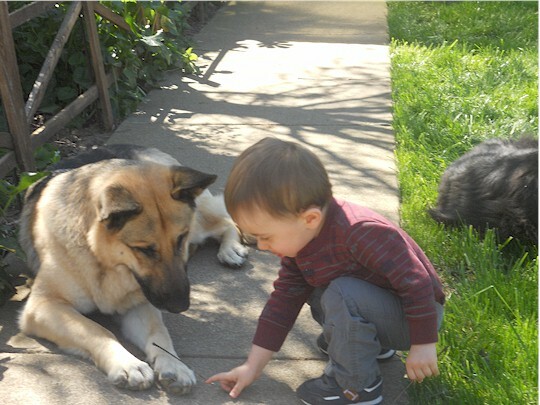 The "boys" are best buddies and Jerry Lee even shares tiny sticks with Alex. Couldn't have asked for a better match. Again many thanks for letting him join our family. Thought you would like to be updated on Yogi. 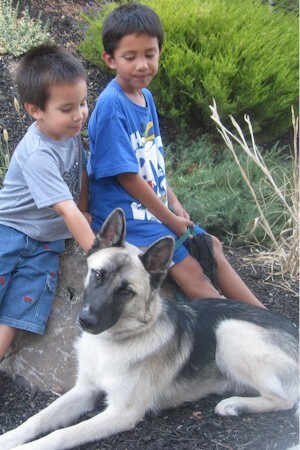 Yogi and my grandson are the loves of my life, Yogi has passed level 1 of the puppy kindergarten and is in level 2. He is doing really well, sits, stays, downs....Having a little trouble with Off, and Leave It but we are working on it. 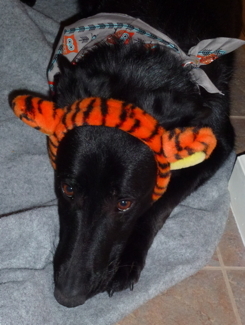 As you can see by one of the pictures, he is not sure if he wants his ears up or down, hehehehe . . . I'm glad that you enjoyed the youtube video of KT and her "stick" and had a chance to see how well she is responding to basic commands. She is so smart and eager to learn. 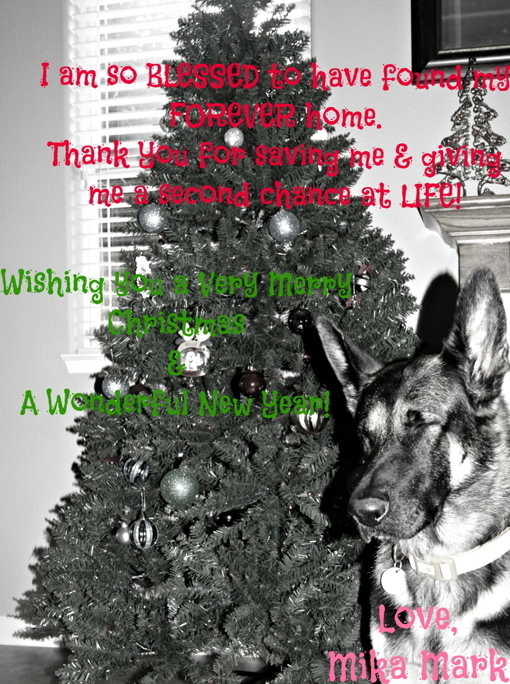 I've attached a couple of pictures of KT from her first Christmas with us. We just adore her! Thank you for seeing the potential in this wild child and trusting us to provide her with a good home. Here is KT on the treadmill! Patrick and I adopted Kona in September and she immediately stole our hearts. She keeps us on our toes and laughing with her non-stop energy and antics. We are very happy we chose to adopt and are so blessed to have this new addition in our lives. She is doing well and enjoying having all this land to run around and play in with her brothers Tucker and Bear. She has no fear, so it is never a dull moment around here. Here's some pictures of her we wanted to share. Thank you so much and have a wonderful Christmas holiday!! Bamse is still a pup - and since she does not realize that she lives in that big body of her's now - she can be very entertaining at times - I don't think we can call her graceful! But we can call her wonderful and we are so happy and grateful to have her as part of the family! Thank you to everyone in your organization for all the work you do to save these terrific creatures! 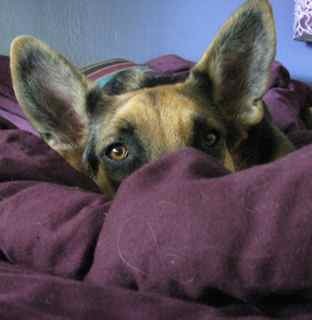 I have attached some pictures of Bamse in her new life in case you have room for a big eared calendar girl! With kind regard and wishes for a happy holiday! We decided that we should send you the latest pics from our "family." 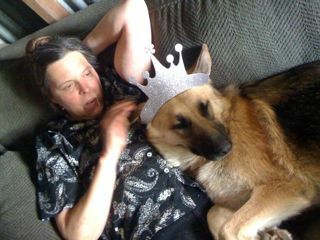 Almost two years ago in January 2009, we adopted the 10 week old puppy that had been found in a culvert within a gravel pit. His name at the time was Dasher. 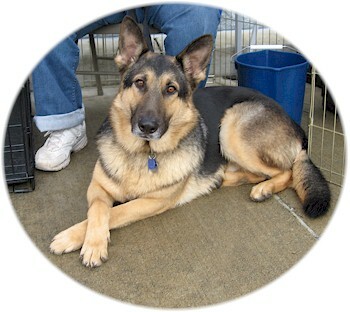 He has now grown into the most handsome, sweet, lovable adult German Shepherd Dog that you can imagine. Since we adopted him we have adopted two other rescue boys......the black one which is a Boston Terrier/Boxer mix and the little Rat Terrier/Chi mix. We already had the one-eyed Lhasa Apso. They are just the most delightful little pack and there is actually one more that is not in the photo. She is a Chow mix but she belongs to our employers and is not really our dog even though she lives here. We would have gladly tried to get her in the picture but it was all we could do to handle these four and make it look like it was easy. Believe it or not, we had taken about one hundred photos to get these two that were just right. And one of these is even a little out of focus because our photographers were shooting so fast to catch the right moment that it was hard to focus the camera and get us all looking in the right directions. It was hilarious really! You have always been so sweet to keep sending us emails and updates so it was time for us to reciprocate. 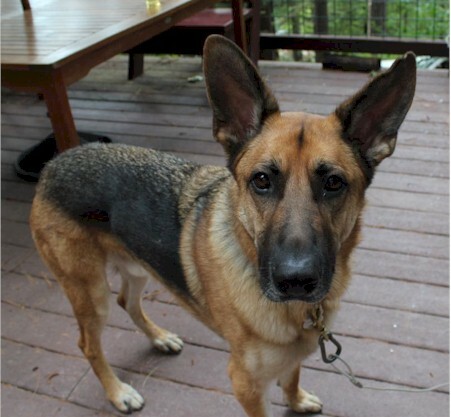 Do you have any updates on Shep's brother, Donner? It would so fun to compare and see how he turned out. Well, hope all is well in the shepherd world and that you are still able to find all these wonderful dogs all good homes. Just alittle update on Pantera. She settled into our house wonderfully. She is a happy girl and so is Chip. 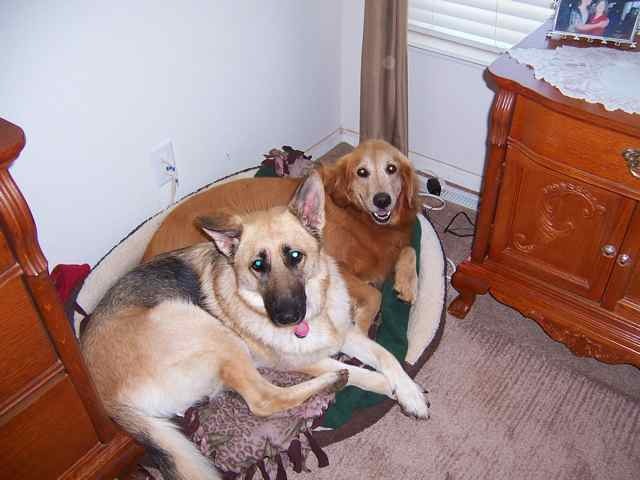 She and Chip are buds and play together wonderfully. Attached are some pictures of her. Thanks again for a GREAT family member. Please let everyone know how much we love her thanks. Just thought I would check in and say hello. Our Cooper (Carson) is such a joy and great dog. 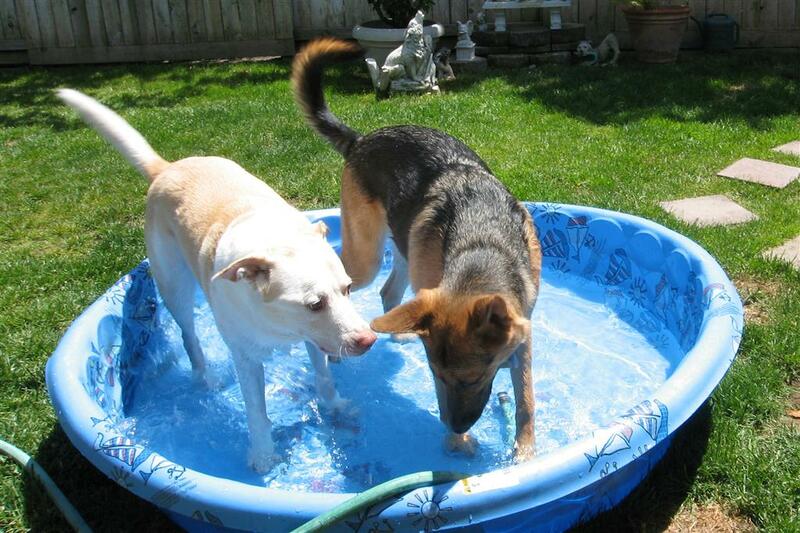 Our Sadie girl and Cooper are pretty much joined at the 'tails', playing, chasing, water splashing…just like kids. 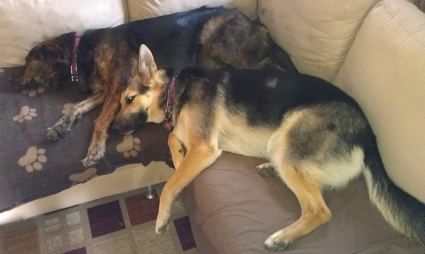 He has learned so much through training and following Sadie's lead. Thank you again for bringing Cooper (Carson) into our lives.